Out West, when I thought about corn, the vegetable took several different forms. There were corn tortillas, corn bread, corn salsa, tamale pie, corn chowder (remember that one? ), corn muffins, corn chips, and, in summertime, corn on the cob. Here in the Midwest, it’s pretty much just corn on the cob, but boy do we do it right and in massive quantities. My brother-in-law typically goes through at least three ears himself, gnawing the kernels down until all that remains is a cylinder smooth enough to revive the corncob pipe industry. And my nephews? Well, suffice it to say that they’re growing boys. Traditionally we boil the corn here, roll it across a stick of butter and dust it with a few shakes of salt. When it’s in season it’s incredible, and now, at the end of July/beginning of August, the corn is definitely in season. It will be perfect for another month before it comes down to earth again, so I figured I’d better strike while the corn was high. Oddly, the thought of a soup comprised of corn, butter and salt didn’t really appeal to me. It could have something to do with bad experiences I’ve had with corn on the cob jelly beans. More likely is the association of this summer favorite with the way we eat it. Corn on the cob is a visceral experience. We throw out our table manners for the summer, pick up the cob and eat it with our fingers. As messy as that pleasure is, imagine making a soup out of it. Although it sounds counterintuitive, if corn on the cob was going to make its way into a soup, it would have to come off the cob. Other ingredients would also have to find their way into the mix, other cooking techniques perhaps, but additional seasonings were the main focus. One of the simplest recipes my wife and I make just uses salt, pepper and olive oil. Another includes lime juice and chili powder. We did it with cheese once too, but that was a bit too messy. We also like to grill our corn. The flavor is terrific and since it’s done outside, it keeps the kitchen cool. Grilling adds an extra step to the soup recipe, though, so I’ve made it optional. You’ll have to sauté the onions and peppers, anyway, so some of you might want to cook the corn and vegetables together in the soup pot before adding the stock. Whether you grill or not, in the end you slice all the kernels off the cob and add them to the pot with the stock, sautéed onions, bell peppers, lime juice and chicken. After simmering for 20-30 minutes, remove the chicken bones and meat to cool before you slice off the breast meat and cut it into small dice. Then you return the chicken to the soup along with the cilantro and seasonings and simmer until it’s done, an additional 20-30 minutes. It’s not exactly Midwestern anymore, but it really features the freshness of the corn, which is a good thing. It’s also more user-friendly than corn on the cob. If the kids are missing a few front teeth or the adults’ teeth aren’t what they used to be, this soup is just the ticket. We don’t all reach our peaks in the height of summer. Some ripen earlier, some later, some are blossoming right now. 1 red bell pepper, cored and diced. Slice the kernels of corn off the cobs. Heat the remaining olive oil over medium heat and sauté the onions and bell peppers (and the corn from the 6 cobs if you’re not grilling) until the onions and peppers get soft, (7-10 minutes). Combine vegetables, lime juice and chicken in the stock. Bring to a boil. Reduce to a simmer for 20-30 minutes. Remove chicken from the soup and set aside. Cut chicken off the bone, cut into small dice and return to the pot. Add cilantro and seasoning and simmer for an additional 20-30 minutes. Serve warm with grilled meats, spicy foods or a cool summer salad. 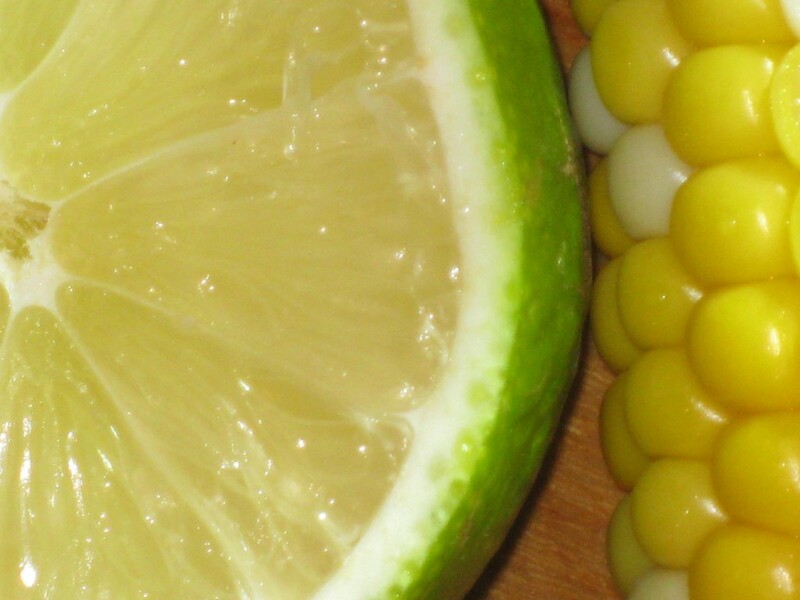 Image Credit: “Lime and Corn Are Ready for Their Closeup,” photo by the author. The corn is as high as an Elephant’s eye. It was knee-high on the 4th of July. Let the cliché-o-rama begin. What’s your corniest line? I’ll be reading and responding. I’m just in the process of making another double batch of this. EVERYBODY loves it. We gave a big container of this to Jodi as a way of thanking her for taking us to the airport a couple of weeks ago. When I asked her how she liked it she seemed a little confused. It turned out that Soni had eaten the whole thing…guess she liked it too.